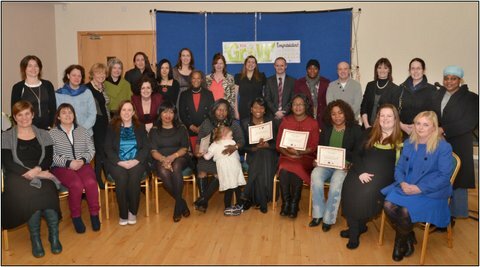 Asylum seekers in Galway and Mayo to benefit. Mayo Intercultural Action (MIA) has secured EU funding of €88,919 to fund the SOLAS project, which will provide much needed supports for Asylum seekers and their families living in Mayo and Galway. This funding comes at a time when there are little or no supports for this very vulnerable group of people who are living in direct provision hostels in The Old Convent, Ballyhaunis, Co. Mayo and in the Eglington Hostel and Great Western Hostel in Galway. MIA, who has been providing information, supports and advocacy for asylum seekers on a voluntary basis in Mayo for almost ten years, will now expand it's work to a regional basis and is teaming up with Croí na Gaillimhe/St. Vincent de Paul in Galway to establish a support centre for Asylum seekers in Galway City and of course here in Mayo. Participants from MIA's EU Funded Women in Business Program receive their certification last year. "This is really great news. MIA is almost ten years old, and we have done phenomenal work over the years providing badly needed supports for asylum seekers, refugee and migrants, on minimal resources and with huge voluntary input from a dedicated team and invaluable support of statutory and community organisations in Mayo. It has always been in MIA's vision to establish itself and work on a regional basis and this is a very exciting initiative which will expand MIA's work to the Galway region. MIA are really looking forward to teaming up with Croí na Gaillimhe, SVP in Galway to establish an additional support centre in the city and providing outreach to the direct provision hostels in both Mayo and Galway. Here in Mayo, there are more than 250 people living in The Old Convent, Ballyhaunis and in Galway, there are 333 people living in both the Eglington Hostel and the Great Western Hostel in the City. Asylum seekers are a very isolated, vulnerable group of people, with very specific needs, and this project, the SOLAS project will focus on providing information, advocacy, and training supports for Asylum seekers in Mayo and Galway. I've no doubt that MIA, with dedicated staff will continue to make a real difference to the lives of Asylum seekers and their families in the region." "MIA has been campaigning for supports and a system that treats Asylum seekers and their families with respect and dignity they deserve, a system that is fair and equitable. Residnets become institutionalised, experience social exclusion, and mental health difficulties due to the delay in processing protection applications, enforced unemployment, enforced poverty, and very limited access to education and trainingWe have highlighted the reality for Asylum seekers and their families forced to live in cramped and overcrowded conditions in hostels. A recent report was severely critical of The Old Convent, in Ballyhaunis due to its poor standards. "Here in Galway, we've witnessed first hand the reality for Asylum seekers living in hostels in Galway city. They are forced to live on 19.10 euro per adult per week and are not allowed to work. The conditions they live in are not suitable. We are looking forward to working with MIA to establish a support centre here in Galway. This will make a real difference in people's lives. This project will provide badly needed information, supports, training and advocacy to Asylum seekers in the City. The Solas project is co -finance by the European Commission under the European Refugee Fund and is supported by the Office for the Promotion of Migrant Integration in the Department of Justice and Equality, and Pobal. " Ensuring a Balanced Migration - A Missed Opportunity? Burma Now - What's The Real Story? Climate Justice for all – what can we do? Ailish Wins Makes a World Of Difference!